While Muslim leaders and apologists continue to publicly tell the media and others Islam does not sanction honor killings, the truth is, Islam does. The most common rebuttal heard from Muslims in the media is that the term “honor killing” is not found in the Koran nor any hadith (records of the actions and sayings of Islam’s prophet Mohammad). The phrase “honor killing” won’t be found in the Koran nor in any Sunnah of the Islamic prophet Mohammad. The authority for a parent to kill their children or grandchildren for any reason they see fit, however, is found in the sharia (Islamic law), and does come from the Koran and Sunnah of Mohammad. The Reliance of the Traveller, authoritative Islamic sharia certified by Al-Azhar in Egypt – the highest authority of Islamic jurisprudence on the planet- and the Muslim Brotherhood’s Fiqh Council of North America, states: “retaliation is obligatory against anyone who kills a human being purely intentionally and without right.” It goes on to say those “not subject to retaliation” includes “a father or mother (or their fathers or mothers) for killing their offspring, or offspring’s offspring.” (‘Umdat al-Salik, Book O Justice, o1.1-2). This means, in Islam it is okay for a mother and/or father to kill their children or grandchildren with no legal consequences. So, even though “honor killing” is not found in the Koran or Sunnah, the authority to do it is. In April 2004 a Turkish Muslim killed his four year old daughter in Scottsville, New York because she was “sullied” by a gynecological exam. In 2006 a Somali Muslim in Kentucky brutally killed his four children and raped his wife because he suspected her of infidelity. In July 2008, a Pakistani Muslim in Atlanta, Georgia killed his daughter because she did not want to go through with an arranged marriage. In October 2009, an Iraqi Muslim from Arizona drove over his daughter for being too Westernized. She died two weeks later and he was convicted of her murder. 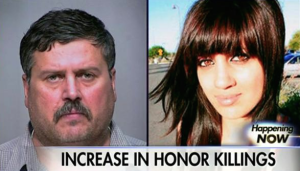 The Department of Justice reports there are approximately 27 honor killings in the U.S. each year. Pakistani Muslim Muzzimmil Hassan founded Bridges TV in Buffalo, New York as the first Muslim American network broadcasting in English. Bridges TV was established to counter negative stereotypes of Muslim. Muzzimmil Hassan (a close friend of Nihad Awad of CAIR) personally demonstrated his “moderation” by sawing his wife’s head off. In March of 2011, Hassan was sentenced to 25 years in prison for this heinous crime. Islam is not a serious opponent of either the United States or Europe. Or really any serious nation. They’re about 1 step above sub-Saharan Africa. For them to become serious they’d have to conquer a first world nation and absorb it’s assets in particular nuclear weapons but all kinds of technology. The problem is we are betrayed. Which is how they got to us and how they got in. Somehow betrayal is a concept that we can’t understand. Certainly we can’t muster eternal response necessary to treason and betrayal – death. Then again they don’t cover betrayal and treason on TV so maybe that’s it. They certainly don’t seem to have covered it in CJ. In short you’re pointing the wrong way Sir. Sure they’re enemies but they’re also far from home. Who let them in? UTT appreciates your input Pat. The problem is that Europe is within 24 months of being overrun by the Muslims so I am not sure how you can rationally come to the conclusion it is not a serious threat to Western Civilization. It’s possible you’re trying to say that Islam *shouldn’t* be a consequential enemy, but they have become so because we have let our guard down for decades. As JG has noted, Europe is teetering on the brink. I hope he’s wrong about the time scale; I just know they had better reverse course quickly–and I see no prospect of them extracting their heads from the sand soon enough. To say “they” haven’t conquered a 1st world country, you are thinking in context of conquering in a traditional manner such as “war”, They have already started taking over our country being in position to change our constitution and taking away our rights. By the time people like “Pat” realize the subtle coup, it will be over. I heard what John said and the others. They know because of their experience. I will take their word for it because actions are backing them up. Muslims are murdering Christians (non Muslims) all over the world. “HONOR KILLINGS” may be “lawful in Islamic Sharia” but in the United States of America, under the United States Code — and regardless of who asserts otherwise, be they: Muslim leader; quisling apologist; media-presstitute or criminally embedded enablers of barbarism — “Sharia” isn’t worth the paper its printed on. “Honor killings” are thus nothing more than COLD BLOODED MURDER, and should be so categorized among the FBIs litany of “Part-1 offenses”. Furthermore, Sharia adherent Muslims (whose birthrate, incidentally, triples every two decades) obviously don’t come to this country to integrate, they come with evident intent to confiscate, both American lives and American treasure, thus should be invited once to leave, and if they don’t go, deported. I am a Muslim, have studied the books though I am not a scholar. -if this ruling about not retaliating against parents is true, it does not mean that these people who killed their children will not face the legal and sharai consequences of murder: retaliation is not the same thing as punishment. The rules for retaliation give limited allowances for the family of the wronged to get their outrage addressed. A life for a life. If the family themselves have killed their own blood retaliation is irrelevant. However legal consequences of murder remain. May the Almighty guide you guys unto the right path. Amin! Amen! !